The fast development of automotive technology is disrupting the mobility industry as we know it. In this flurry of new players and increasingly autonomous technologies, functional safety is becoming a key concern for automotive developers. 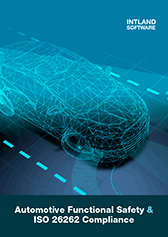 OEMs, suppliers, and regulators work to ensure functional safety in a smart, connected, electric, and self-driving future. ISO 26262 remains the go-to safety standard, with new regulations on autonomous technology underway. This guide provides fundamental information to help automotive development companies ensure their products’ functional safety and achieve compliance with both current (ISO 26262) and future regulations in the automotive industry.